An unusual and somewhat supernatural thriller that crosses demonry with law and amounts to something like rosemary’s baby meets the firm. 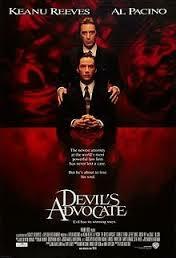 The Devil’s advocate is a very unique and creative movie. The parts feel might feel at times like we’ve seen them before, but really it’s just because this movie has figured out the perfect way to combine things that worked in other films. Its rosemary’s baby meets the firm. It’s the first movie about the devil that isn’t either a comedy or a horror film. So what is it then? A thriller. A mystery. It’s even got elements of a legal drama. With so much stuffed into one movie, it’s pretty amazing that things work out so well. That’s in large part due to the freshness of the plot and then of course also due to some pretty solid casting. In particular the two leads. Keanu Reeves and al Pacino. Keanu Reeves will always be more frat boy then scientist, which is why point break and speed are his best career roles, but he does a lot better playing a southern lawyer in this film than he does playing a genius in chain reaction, Johnny Neumonic, or even the matrix. 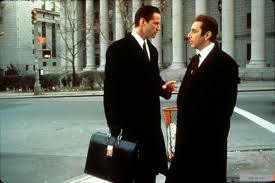 It was wise of the screenwriter to make him a lawyer from the south as opposed to a big time New York lawyer. Reeves can play the relaxed, laid back, southern comfort kind of guy and he handles it well. And when the plot brings him to New York and he’s supposed to be out of his element, it’s not a problem, because as an actor, he really is out of his element. If Reeves is good, playing young and naive lawyer Kevin Lomax, then Pacino is magnificent. He’s the star of the movie, even though Reeves is the protagonist. Pacino is the highlight of the film. He plays john Milton, aka the devil, all sleazy and secretive. He’s a guy who can manipulate everything and make you do terrible things and think it’s your own idea. Just like when Milton tries to convince Lomax to go to his wife and Lomax refuses. You’re kidding yourself if you think it’s not exactly what Milton was hoping to hear. The basic premise of the movie is that Lomax is a lawyer in the south who has never lost a case. And a top New York firm to come there and work for them recruits him. The head of the firm is john Milton. And everything seems too good to be true at first. Giant apartment, lifestyle of the rich and famous, other people at the firm being all warm and welcoming. But then things start to happen. Lomax starts to realize that his clients aren’t such great people, (the truth is, his pervert client back home wasn’t much better.) but here, Lomax’s wife, Marianne, (played by Charlize Theron in one of her better and earlier roles), starts to go crazy. Lomax ditches her at a party after he promises her not to, and soon she is seeing things and telling wild stories about being raped. Lomax handles multiple cases, starting with a cultural rights case with Delroy Lindo as an African who kills a goat. This is just warm up stuff. The real case involves Craig T Nelson as one of the firm’s top clients who has just been arrested for murdering his wife. And as the case goes on, Lomax starts to realize that all of the witnesses are lying and maybe his client really is guilty after all. We mix in between the storyline of this high profile case, the story of Lomax and Milton spending time together, going to things like basketball games, and the story of Lomax and his wife, which is perhaps the most troubling of them all. There are demons and monsters hiding in the corners of this movie, brought on screen with great subtlety by director Taylor Hackford. This is the guy who directed an officer and a gentleman so many years ago, and he knows that the less you show, the scarier and more believable it is. And so he keeps his monsters to a minimum, using them mostly as quick hallucinations by Marianne. And as the movie goes on, the tension builds. Another lawyer at the firm, played by Jeffrey Jones, meets a cruel fate while running around the reservoir in central park. He comes across some demon joggers or homeless men who seem to be a response to his threatening Lomax for rising up in the firm so quickly. Marianne also runs into problems that get more and more serious and threatening. And then there’s Lomax’s mother who shows up with secrets of her own. One of the reasons this movie works so well is because it doesn’t hold back. It is very careful and cautious in the way it presents its ideas, not wanting to cross over the line that separates serious from silly. But as it goes on and feels like it has the freedom to become looser, we get all of the answers we were hoping for and then some. We get to hear Pacino say exactly what we wished he would say and shout out the kind of rants that only he can do. And as the devil, talking about his anger at god, he’s finally got good reason to sound this way (how many movies does Pacino end up shouting for no reason and sounding like a lunatic)? The other reason it works is because it’s scary. Without being bloody or grotesque in any way, it’s scary because we don’t know what’s coming, but feel like we’re in the presence of a terrifying evil. And that’s where the rosemary’s baby ideas come in. The lawyers of this firm all live in the same building with Milton in the top floor penthouse apartment (this building is on Fifth Avenue, overlooking central park. Ironically rosemary’s baby took place in the Dakota building on the exact opposite side of central park. The west side). I love the way the movie builds slowly, never revealing too much, and setting us up for an exciting climax with Marianne followed by the ultimate ending with Milton. This movie is quite the masterpiece, finding the perfect ideas and ways to combine them. It’s a psychological thriller that ventures into the supernatural and finds a way to make it all feel remarkably unique.